Libraries and magic? Count me in! The premise of this book sounded just so cool that I had to give it a try and the pretty cover definitely added to my excitement for this book. This book is exactly what the blurb promises and more. There are people who can jump through books to other libraries and the main character and her friends get caught up in that magical world. It was an exciting read and I enjoyed reading this book, although there were a few parts that were a bit cliché or predictable. While it’s a long book, the pace was well done, there were a few places where it felt a tad rushed though. There is enough going on and the story kept my attention. I really enjoyed being immersed in this world and learning more about it and the characters in it. I do feel that the focus is pretty much on the story and while the other aspects are well done too, it’s the story and unique concept that makes this book shine. Gia is the main character and I liked her, she was afraid and missed home, but also knew that this was her new life now. Which I think was realistic. I did wish we would get more of a feel for her emotions at times, in some scenes it was really well done and in others I really wanted to know what she was going through and thinking, like when later on I the book she loses something and it doesn’t seem to affect her at all. She does change over the course of the book as she goes from normal school going teenager to learning more about herself and the world of the Mysticks. There is a bit surrounding her that was a bit cliché and I could’ve done without, but I do see why it is necessary for the story. The side characters do make the book more interesting, but they do stay pretty flat. Luckily the story more than made up for it, but I wish we learned a bit more about the characters. There are some side characters Mysticks and I kept forgetting who was who as we didn’t get enough of a feel for them. There is quite the large cast of characters which probably made that even harder. There is a hint of romance and while it was built up nicely, it still felt a bit like insta-love and I just didn’t quite feel it. They were nice together and I did see why they were attracted to each other, but I didn’t really feel their spark or connection. Then there is a hint that it could turn into a love triangle and while she did make her decision, I do have a feeling that it might change later on. I did like the love interest, but I just didn’t quite feel their connection. And there is some relationship drama which I could’ve done without. The concept behind this book is pretty cool with the focus on libraries and magic. It is unique and the world building behind it did make sense and added a reason to why they used the libraries. There are some battle scene sin the libraries that are pretty cool, although it also felt like a shame to fight there, it did was original and added a certain feel to the battles. The mysticks world was interesting and I did like the world building that we got. I liked the sentinels and the whole globe magic system, but I also wondered about how some things worked exactly. There are wizards, sentinels and other creatures and at times it felt like they tried to put a bit too much into this. There are some things that remain unclear or stay a bit vague, but I am thinking that will be revealed in later books in this series. Have you ever read a book where libraries played a prominent role in the story? That’s an interesting part of the story…libraries. I can’t think of another book that I’ve read that had a library prominently featured in the book. Me neither. The focus on the libraries was fun and it worked nicely with the rest of the story. The Library Thief! I still can’t get the right title in my head, haha. Anyway, I’m glad you liked it. It sounds a little disappointing that you didn’t really connect with the characters since I’m a character person, but I have read books in which the story made up for that, so I get what you’re saying. If I get a chance to read this book, I probably will since the premise still sounds really interesting. Great review! Kristen Burns recently posted…Discussion: What Do You Listen To While Reading, Writing, and Blogging? The characters were nice, but I just would’ve liked a bit more. I want to feel their feelings and know what they are thinking. I just felt they could’ve used a bit more depth. The story does really make up for that and so much is happening that you don’t realize the less focus on the characters. And I hope you get a chance to read this one eventually! This one has an interesting premise. Although when they add in secondary characters, I would rather have them fleshed-out rather than just having them there to fill up the page. I don’t think I’ve ever read a book where a library played a prominent role in the story. Although I have watched the Librarian. The premise was really cool with the magic and the library jumping. The secondary characters could’ve used a bit more depth, but I am hoping that might happen in the next book. I think this is the first book I’ve read with libraries play such a prominent role. It sure made for fun settings. The library jumping is pretty interesting. I’m curious to read how that works exactly. Hopefully it’s more character driven in the second book. Maybe the author wanted to focus more on the myth and world? The library jumping aspect was really cool and it was explained pretty neatly how it worked too. I didn’t mind the focus on the myth and the world, as that part was interesting, but it would be nice to have a bit more focus on the characters in the next book. 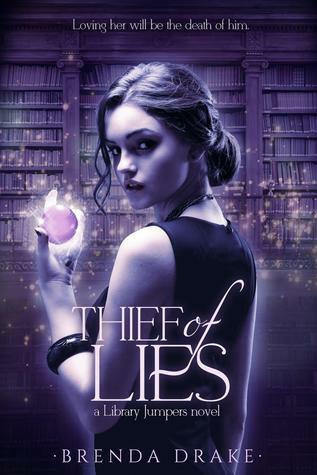 It was the cover that grabbed my attention with that pretty purple colour and the bookcases ofcourse ;). I am glad the book was just as good as the cover! I hope you’ll enjoy this one once you get aroudn to reading it. The focus on the libraries and the magic really worked for me. I’ve read a couple of books with a library setting and I confess that I grabbed them because of that. This cool how the magical world plays a role. I’m glad the heroine seems to have a good head on her shoulders. Too bad the side characters are a tad on the flat side. I don’t care much for the love triangle idea, but I guess if she makes her choice and sticks with it then that won’t be too distracting. Glad it was an overall good one. You can’t really blame a booklover for grabbing a book because of the library setting ;). I wonder what will happen to the possible love traingle in the next book as I think it might play a bigger role then, but I liked how it was handled here. And I am hoping we see a bit more of the side characetrs in the next book. But beside that it was a great book. Wow.. a book about beautiful libraries?? Sounds like a bestseller!! It definitely sounds like an original story and it really sparks my interest. Too bad there were so many characters.. I would also have trouble with that since I’m really bad in names and tent to confuse characters if there are to many. That cover is also very cute!! The library settings was so fun and I think it would attract a lot of readers, especially combined with that pretty cover, it sure caught my attention. I just wish I could form more of a imagine in my head of each character as I am so bad with names and I get easily confused when there are a lot of side characters. The world was really unique and the library setting and the magic added an interesting feel and atmosphere to the book. I hope you can pick this up! I’ll be looking forward to hear what you think of it. This one sounds fun! I love books about books/libraries so it has gone on my TBR for future reading 😀 thank you for sharing Lola, and wonderful review! I think the library part is going to attract a lot of book lovers to this book. And I am happy it was done well, it was so much fun to hear about a few libraries in the book and the library jumping thing was really cool.